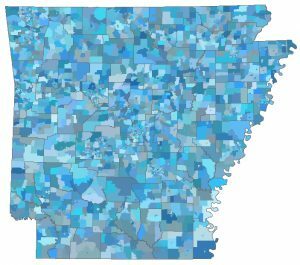 The Arkansas Geographic Information Systems (GIS) Office is pleased to announce a major update to the election precinct boundaries that are now available online at gis.arkansas.gov, the state’s GIS platform. The agency worked in close partnership with each of the 75 County Clerks over the last six months to review and verify the election precinct boundaries. This work continues as the state agency readies portions of the state’s GIS database for rollup to the U.S. Census Bureau as part of their Voting Tabulation District program. The program is designed to ensure the Census Bureau has the most up to date precinct boundaries. The data is fed into the Census block file, which is the foundation for the redistricting of congressional, state and local political districts. The Arkansas GIS Office would like to thank Arkansas’ County Clerks and the Arkansas Secretary of State’s Office for all of the effort they put into this considerable task. Arkansas has 2,900 election precincts that are used to administer elections. While some precinct boundaries remained unchanged, most changes were due to maintenance from election commissions as well as changes made to city boundaries via the annexation process. The underlying goal is to ensure that both the public and private sectors have access to the highest quality precinct information prior to the decennial Census that will take place in 2020. Further, political consultants and redistricting software companies are highly interested in a statewide version rather than assembling their own file piece-meal on a county by county basis.